SOUNDWAY'S WORKSHOPS ARE THE MOST EFFECTIVE SOLUTION AVAILABLE. NOTHING ELSE COMES CLOSE. Soundway’s Efficient Speed Reading workshops are designed on a foundation of over 40 years of research & experience. We enhance this by incorporating proven current scientific knowledge about learning, reading and the brain. And we’re continuously improving the learner experience by integrating new scientific discoveries, our own research and the collective experiences of our Learning & Development team. Each of our workshops integrates pioneering research on the psychology and physiology of reading, how the brain “comprehends” and the science behind memory retention. Over 10 000 participants benefit from this each year. Find out more about our methods here. We build state-of-the-art technology, fun games, engaging exercises, videos and creative memory techniques into each workshop & learning experience we develop. Workshops are designed by an international team of experts. Before anything is used in our workshops, it is thoroughly reviewed by a senior development team, using our stringent 14-step approval process. This ensures that all of our workshops are delivered at the highest quality, every time. Above all, we incorporate our trademark Chaos & Mayhem Learning System into all our workshop. Check out our workshops here. include SoundwayTracker, used to record and chart individual progress through the workshop. You’ll know how you’re progressing right through the workshop. There’s no guesswork. You’ll also get a 14-day VIP Pass to use the best speed reading software available. 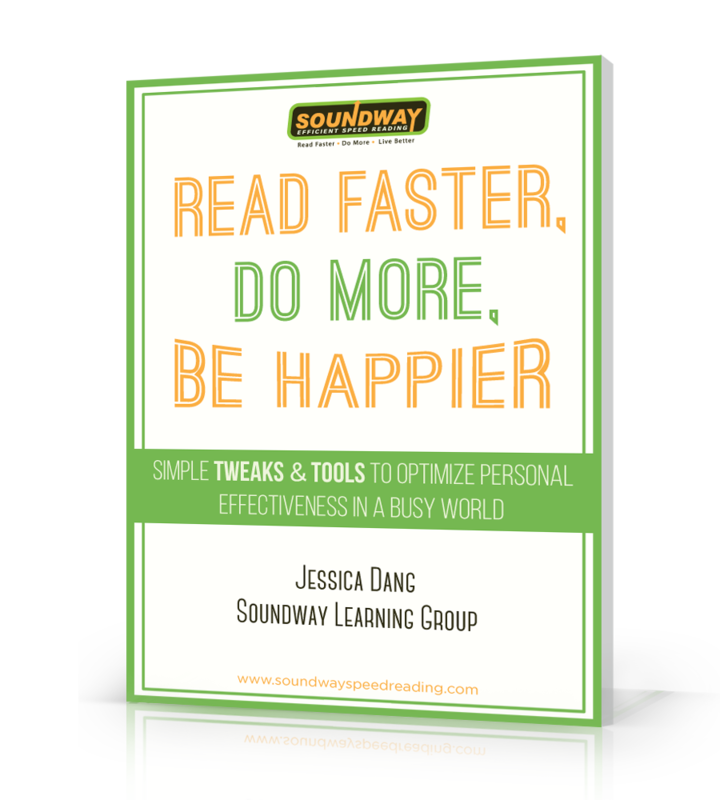 Developed by Soundway over 3 years, you will further improve your reading speed just by using it for 10 minutes a day, for 10 days. And it’s all included for free in our workshops. Find out more about what you get at our workshops here. teaching. Part educator, part entertainer and 100% focused on helping you achieve your goals. All our facilitators are rated “Excellent” by participants. Each is an expert at making even the driest, most complicated topics entertaining and easy to comprehend. We maintain a low FACILITATOR:STUDENT ratios to ensure each participant receives the right amount of attention. The reality is that we forget almost everything we learn at any workshop within a week, if we don’t immediately & actively revise what we learnt after the workshop. Fortunately brain researchers and scientists know how we can avoid this loss of learning. At Soundway, we use this knowledge to significantly increase the retention of learning by our participants. From software, reminders and Action Plans – we’ve got you covered. Soundway participants double or more their reading speed – most times in just 1 day. And we’re confident you’ll experience the same impressive gains. In fact, we offer a Moneyback Guarantee. If your reading speed does not increase, we’ll return your money. See what past participants say about us here. ‘CHAOS & MAYHEM LEARNING SYSTEM’ FIRST HAND. FUN REALLY IS THE BEST TEACHER. Soundway’s workshops are the culmination of over 40 years of experience in developing rapid reading tools & techniques, combined with extensive international research, expert learning & instructional design and cutting-edge technology. This is not an upgrade of any program that has come before it, but a complete and thorough overhaul based on the very latest scientific research into the pedagogy, psychology and physiology of reading, learning and memory retention.